TNCWWB Recruitment 2018 2019 | TNCWWB invites Application for the post of 177 Junior Assistant, Data Entry Operator (DEO) Posts. 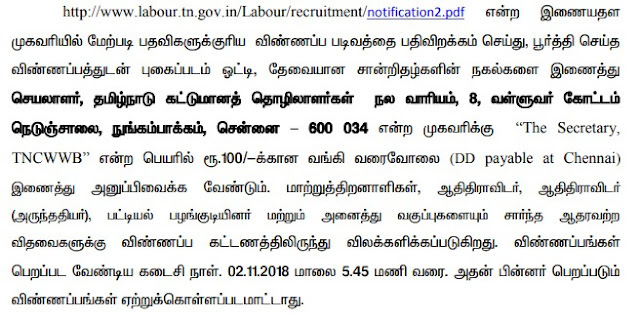 TNCWWB DEO, Junior Assistant Jobs Notification 2018 Released. Opening Date and time for Submission of Application is 17.10.2018 and end up by 02.11.2018. You can check here TNCWWB Recruitment Eligibility Criteria, Pay Scale, Application Fee/Exam Fee, TNCWWB Selection Process, How to Apply, TNCWWB Syllabus, TNCWWB Question Paper, TNCWWB Admit Date Release Date, TNCWWB Exam Date, TNCWWB Result Release Date & other rules are given below. How to apply TNCWWB DEO, Junior Assistant Vacancy?